Some motorcycles just look exactly ‘right’, with every component in aesthetic harmony. To my eyes, Shane Venn’s ‘Dresda-Davidson’ is one of those bikes. It’s using a 1970 Harley XLCH Sportster motor in a Norton wideline featherbed frame, and it was built by Dave ‘Mr Triton’ Degens of Dresda. 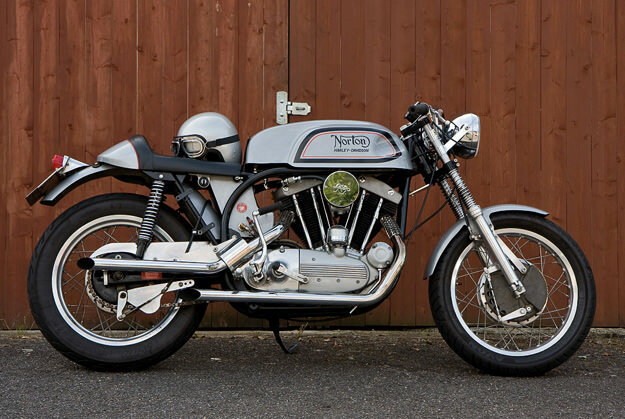 To accommodate the Harley’s right side chain drive, Degens fitted a box-section swinging arm and a reversed Norton rear hub. The Oldani-style twin-leading-shoe front drum brake is drilled and ventilated to disperse heat, which is probably a good idea given the torque output of the 54 ci (883 cc) ironhead motor. The aluminum rims are >Morad, the shocks are Hagon, and the front forks are Triumph/BSA telescopic units with the springs exposed. This bike appears in a recent issue of Greasy Kulture magazine; owner Shane Venn is quoted as saying, “I’ll keep this long term now, and I already use it for weekend blasts and occasionally to go to work on. It feels like a modern bike, or a modern classic at least, and looks fantastic. 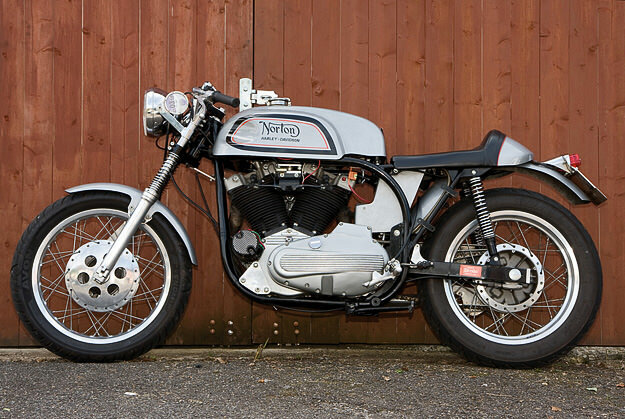 I don’t know about you, but I reckon this machine is one of the best Norton-related café racers around. Thanks to Greasy Kulture editor Guy Bolton; the images are by James Adam Bolton.